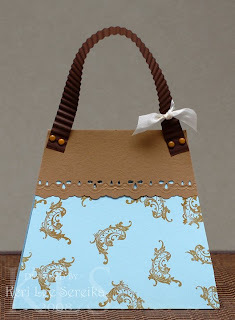 Here is the fun tutorial for my PURSE CARD!!! FINALLY!!! 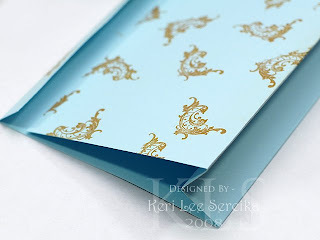 I thank you all for bearing with me lately...it has been a bit on the crazy side...but tonight I am going to share with you the tutorial I created and uploaded to the Card Positioning Systems Blog tonight!!! Enjoy! 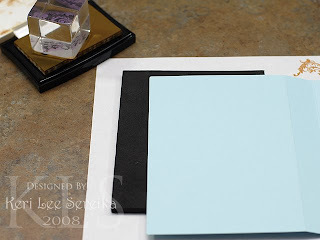 Step Three: Stamp randomly on the two larger panels of the scored cardstock. 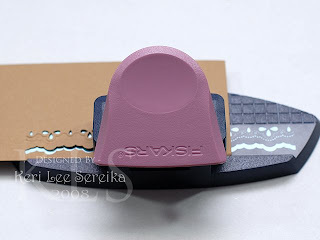 Step Four: Fold your cardstock so that you have a valley/mountain fold at the bottom and a flap at the top. 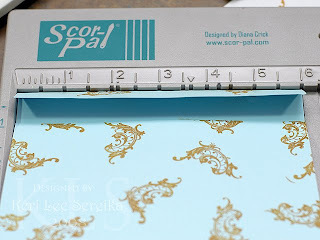 Step Five: Place the folded rectangle back into your Scor-Pal and make a small score mark at one and five inches...just a tiny little notch..not a line..this is just to make a mark one inch in from either edge. 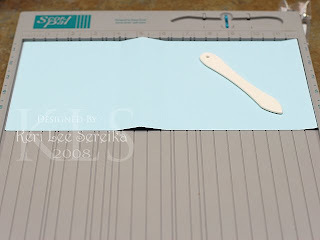 Step Six: Place your small score mark on the cutting edge of your trimmer and line up the the bottom corner and cut. 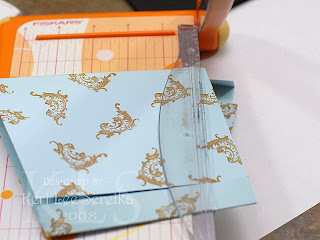 You will now have a trapezoid or quadrilateral purse shape. 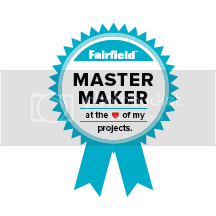 :) (see that geometry we all slaved over does come in handy later on in life!!!) Set the purse part aside for now. 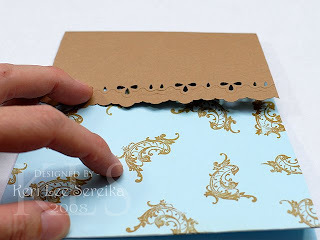 Step Seven: Cut a panel of contrasting cardstock (Tawny Med) and use the Eyelet Embossing Border Punch to create a pretty edge. 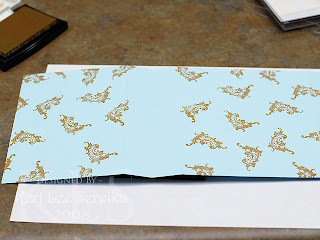 (the panel of cardstock should be atleast three inches wide and as long or longer than six inches....you will trim it later so the actual size doesn't really matter...can you say SCRAP PILE???? Step Eight: Score .5 inches from the straight edge and adhere to the back of the purse. 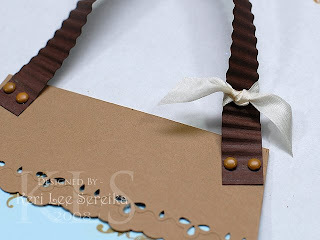 Adhere the front to the top flap of the purse. Step Nine: Crimp a .5 inch of another contrasting paper (Suede Brown Dark) and then adhere to the top edge of the purse using two brads, repeat on the other side. 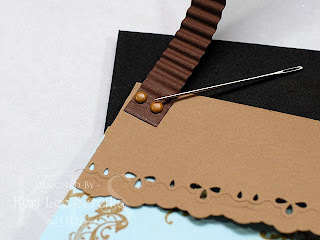 Step Ten: Tie a nice bit of silk ribbon around the right side of the handle to finish your project!